Five Oaks by-the-Sea, la parfaite escapade balnéaire maritime. Belle maison de bord de mer 'Lunenburg Bump', à quelques minutes de la ville de Mahone Bay. Five Oaks confortablement jusqu'à 10 personnes donc ce est parfait pour les réunions de famille. La maison est 25 années jeune et construit pour répliquer la maison du Cap de style classique 1700 avec Lunenburg Bump. La plupart des chambres ont une vue imprenable sur la baie. Une grande terrasse, avec vue sur l'eau, rend la conversation extérieure et des repas un jeu d'enfant. La propriété fait face à 300 pieds de rivage avec vue sur le majestueux Mahone Bay. Marchez le long de Hanson et Hirtles Coves sur l'une des routes de Cove distinctifs et pacifiques de la région. Les enfants adoreront explorer la côte rocheuse à marée basse. Il ya cinq chambres, dont deux à l'étage principal et trois au deuxième étage, dont une suite de deux chambres de famille lié. Un beau salon avec cheminée donnant sur la baie. Une salle de séjour séparée, également avec une cheminée, contient toute la technologie familles ont besoin, y compris une grande télévision à écran plat et lecteur DVD 42 ". Une jolie affût Lunenburg Bump coin salon au deuxième étage est l'endroit idéal pour lire ou parler autour d'un café du matin. La maison a beau pin de large étages partout. Une cuisine et salle à manger, récemment rénové, avec de nouveaux appareils et tous les conforts de la maison a été achevée en 2012. La maison est équipée d'une connexion Wi-Fi gratuite. Repas en plein air est parfait sur la nouvelle plate-forme avant de la maison. Il ya aussi un nouveau barbecue à gaz. Les installations comprennent également deux salles de bains (une à trois pièces et un quatre pièces). Nous avons meublé Five Oaks avec une combinaison d'anciens et de nouveaux - nouveaux lits et canapés complétés par de belles antiquités de la région. Draps en coton égyptien et serviettes blanches rendent l'endroit se sentir comme à la maison. Magasins locaux portent favoris locales merveilleuses comme croquettes et rouleaux de homard, scones et muffins aux bleuets de framboises chaudes. Vous pouvez manger sur place ou déguster quelques-uns des nombreux restaurants fantastiques à Mahone Bay, Lunenburg ou Chester. Les trois villes se trouvent à seulement quelques minutes en voiture. Grandes plages locales comprennent Hirtles, Croissant, Green Bay et Rissers. Conduisez vos vélos le long des nombreuses routes courbes qui épousent la mer! • Demandez à votre café du matin ou un verre en fin de l'après-midi en regardant les bateaux passant alors qu'il était assis sur le poisson amusant en forme de chaises Adirondack. Chaises et table également disponibles pour manger en plein air. 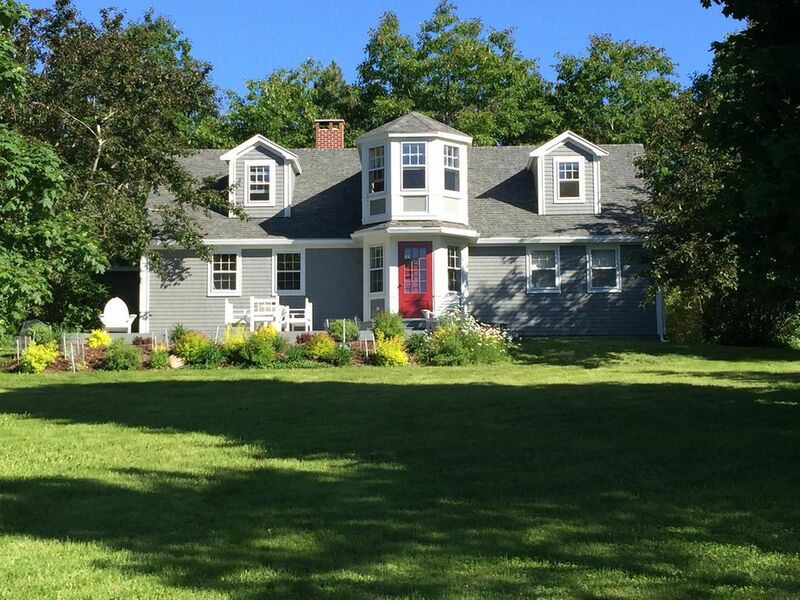 Beautiful home in picturesque Mahone Bay. Five-Oaks-by-the-Sea was the perfect setting for our family to come together and celebrate our parents’ 50th anniversary. The home is spacious and clean with all the comforts of home. Beautiful location with ocean view. A character home with lots of room for our party of 9. We absolutely loved staying at 5 Oaks and were sad to leave after a week! It came equipped with everything we needed including a BBQ, kitchen utensils, wifi and tv. We spent a lot of time out on the deck looking out over the water. There was lots of room for our party of 9 and never felt like we were in each other’s way. There are hiking/ biking trails just up the road. Mahone Bay has fabulous shops and restaurants - a charming village. Great location for day trips to many great sites. James was great to work with and was very responsive to calls and inquiries. My wife and daughters arrived for a weeks vacation to explore the historic towns of Mahone Bay and Lunenburg, enjoy fresh Maritime seafood, and relax on the coastal beaches. Needless to say, we had a great time. We were particularly thrilled with the opportunity to sail on the Bluenose II which sails out of Lunenburg during part of the summer. The house we leased through VRBO was wonderful. I would agree with all of the previous reviews including the statement that it exceeded expectations: it was lovelier and more spacious than the photos conveyed. If you are looking for a high quality home which is beautifully decorated, filled with character, and in a superb location, look no further. We hope to visit again. I used the house in Mahone Bay for a family gathering and was very pleased with every aspect. My experience on VRBO has been mixed, although on balance pretty good.. Everything in this house was as expected or better and the location is very charming. Everything went smoothly and I have no hesitation recommending this place. The house and surroundings are lovely and very tranquil. The rooms were beautifully decorated and I loved the really modern and open kitchen which made making meals easy and a great way to connect with the family. We cycle so I rented bikes at a wonderful cycling store in Mahone Bay so we could explore some of the trails and roads that hug the shore. The views were spectacular! The town is also lovely and a great place to spend an afternoon shopping and enjoying local culture. Lunenburg and Chester are also close by and definitely worth visiting. This is one of the nicest vacation rental properties I've ever been in and I'd highly recommend it to others. Our family has used VRBO often and we have stayed in many lovely homes - this has been our favourite. The house was very spacious, beautifully decorated, and provided all the amenities that we needed for cooking, laundry, etc. We could not have chose better. There was also plenty of outdoor space for our kids to play and explore. The house is situated on the ocean a quick 3 minute drive from the Town of Mahone Bay which made life easy when we needed groceries or wanted to spend some time sightseeing and shopping through this historic and lovely town. We were also close to other sightseeing locations such as Chester and Lunenburg. The owners were very helpful providing recommendations on places to visit and things to do including renting bicycles and kayaks in town. We had a great time and highly recommend this house. Cancellation Policy: Refer to owner's lease agreement Taxes ARE INCLUDED in the published fees.